Olives are the fruit of the olive tree, well-known for its symbolism in different religious traditions. The medicinal use of the olive tree is as old as humanity, and some of the main benefits of the olive fruit are reducing inflammation and keeping in check cholesterol levels. 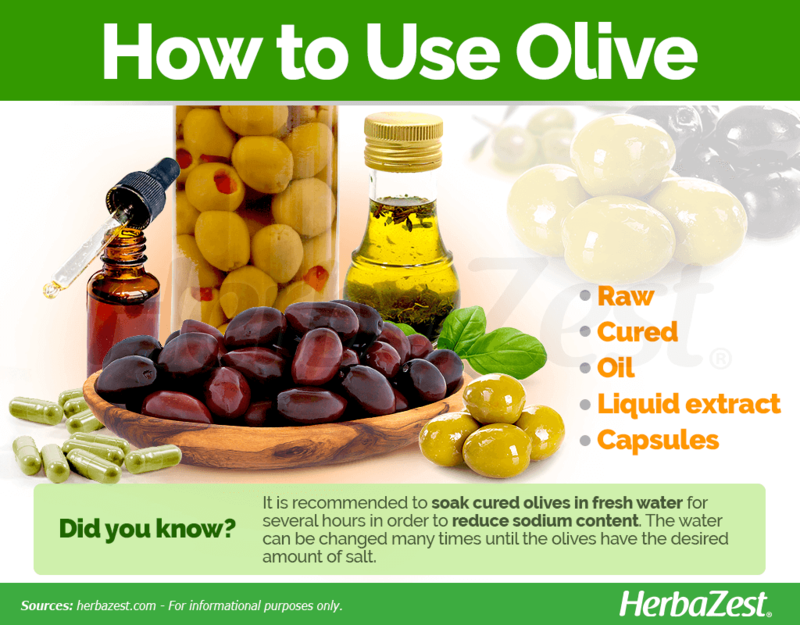 Learn more about olive's medicinal properties and how to consume them. The olive tree hailed from the Mediterranean and Middle East, where it was cultivated for the first time around 4,000 BCE, in the coastal, sunny regions of Syria, Palestine, and Crete. Today, the production and trade of olives and their derived products continues to be an important industry, and olive's health benefits are widely recognized by modern science. Balancing cholesterol levels. Olives help to reduce dangerous levels of low density lipoprotein (LDL) or "bad cholesterol". Preventing atherosclerosis. The consumption of olive oil prevents the accumulation of triglycerides in the arteries. Delaying oxidative damage. Olives and their derivatives, such as olive oil, contain antioxidants that prolong cells' life, delaying the appearance of age-related diseases. Treating allergies. Olives possess antihistaminic properties, which can help reduce the symptoms of allergies. Fighting colds and influenza infections. Olives have shown to have immune system boosting properties, warding off harmful pathogens. Disinfecting wounds and scrapes. Olive leaf extract possess antimicrobial properties and it can be applied over superficial wounds. The reason behind olive's varied medicinal properties is the unique combination between its oil's superb nutritional value and the supporting phytocompounds found in its leaves. OLE contains different polyphenols, mainly oleouropein and oleocanthal, as well as tyrosols, phenolic acids, flavonols, and flavones. As far as its nutritional value goes, both fruit and its resulting olive oil are mostly praised for its relatively high amount of unsaturated fatty acids, such as omega-3, omega-6, and oleic acid. 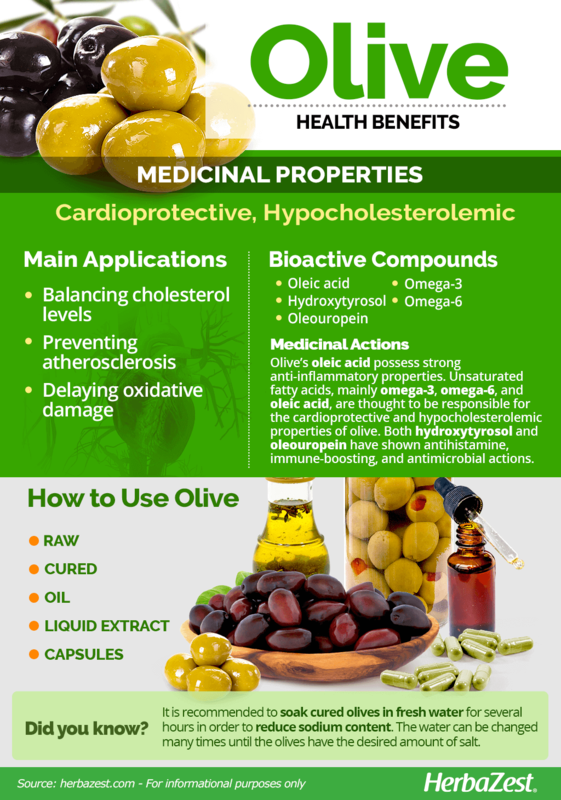 These compounds are mainly responsible for the cardioprotective and hypocholesterolemic properties of olive. The fruit's oleic acid content has been found to possess anti-inflammatory properties, and both squalene and oleic acid have been studied as potential antioxidant agents. Meanwhile, the large amount of unsaturated fatty acids contained in olive oil can help push LDL cholesterol away from arteries, while raising levels of HDL (or "good") cholesterol, and thus protecting against heart disease and atherosclerosis. As for OLE, the hydroxytyrosol content has been shown to contribute to bone mass preservation and arthritis prevention. Both hydroxytyrosol and oleouropein have also shown antihistamine, immune-boosting, and antimicrobial actions, although there is not yet sufficient clinical evidence in humans regarding the effectiveness of these uses. Eating a daily serving of 12 green olives can help reduce body fat, as well as oxidative stress and inflammation levels in the body. Other herbs rich in omega fatty acids are chia and sacha inchi, and both of them support cardiovascular health. Olive and olive oil likely safe for most people when taken by mouth or applied to the skin. 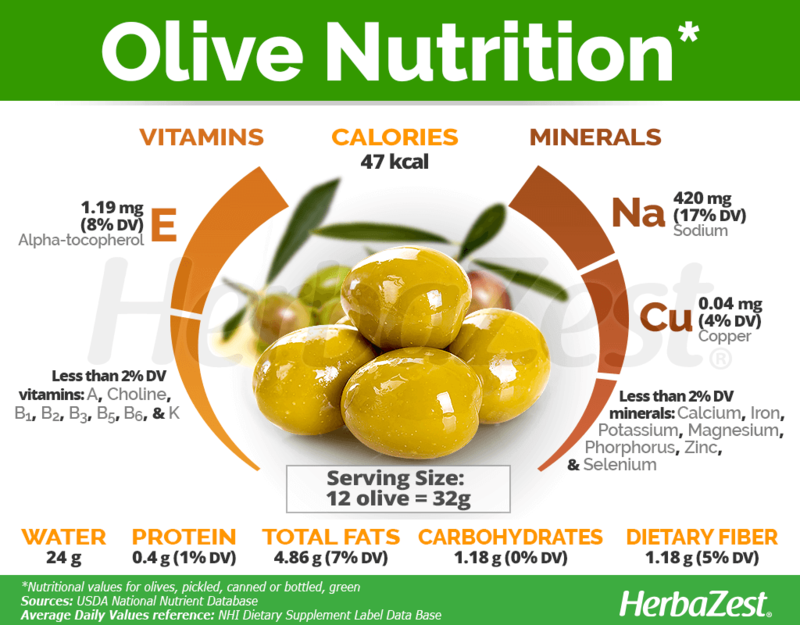 Since olive oil is high in fat, it should not account for more than 14% of the daily calorie intake, which is approximately two tablespoons daily. Olive tree pollen can trigger seasonal allergies. Since olive oil can affect blood sugar levels, it should not be taken two weeks prior to surgery. Given that cured olives contain high amounts of sodium,it is not advisable to consume them in large quantities, taking into account that the limit for the daily intake of this mineral is 1500 mg for people with hypertension, and 2500 mg for those in good health. 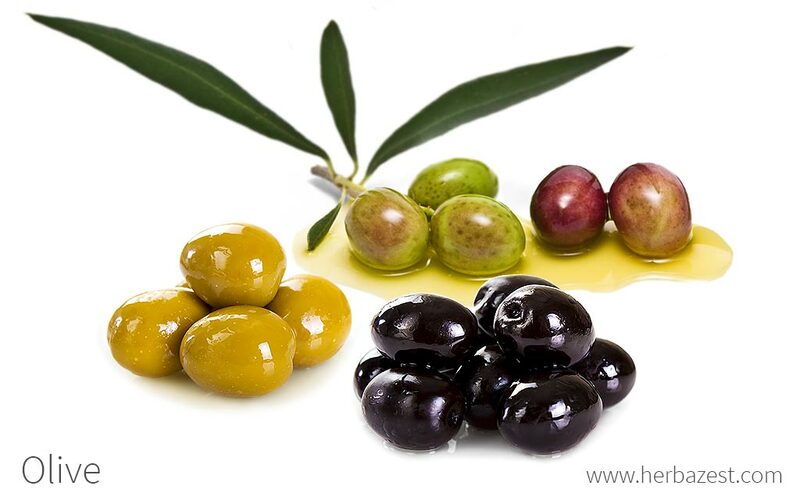 The greatest value of olives lies in their high content of healthy fats, mainly omega-3, omega-6, and oleic acid. which are particularly concentrated in olive oil; however, cured olives, widely available throughout the world, also contain essential minerals such as calcium, iron, and copper, although in small quantities. Olives are a good source of vitamin E, an antioxidant agent essential for cell regeneration and for good skin health, and also provide minimal amounts of B vitamins, choline and vitamin A, all of which help to improve the antioxidant and regenerative capacity of the body. 12 GREEN OLIVES (ABOUT 32 G) PROVIDE 47 CALORIES, AS WELL AS 7% AND 5% OF THE DAILY VALUE FOR HEALTHY FATS AND DIETARY FIBER, RESPECTIVELY. Olive oil has the highest percentage (over 70%) of monounsaturated fat of any edible oil. Extra virgin oil is great for salads, whereas virgin oil is a healthy choice for high temperature cooking, since it reaches a high smoking point of 420°F (214°C). The most effective way of obtaining the health benefits from olive is consuming it as food. Olives picked off the tree contain high amounts of oleuropein, a potent antioxidant with a bitter taste, so they need to be “cured”, in order to make them palatable. The most common curing processes use brine (a concentrated salt and water solution), dry salt, water, or lye treatments. Raw. While it is rarely consumed fully raw, it is safe to consume olive in this form. It will, however, be quite bitter. Olives in this state are an excellent source of vitamins A and K.
Cured. Curing it in brine or dry salt is a common way of preparing olives for consumption. Because olives are a great source of unsaturated fatty acids, such as omega-3, they are great for balancing cholesterol levels. After draining the liquid of the jar or can, it is recommended to soak the olives in fresh water for several hours in order to reduce sodium content. The water can be changed many times until the olives have the desired amount of salt. Olive Oil. Widely used for culinary purposes, olive oil is not only flavorful, but also a strong source of oleic acid, which is high in anti-inflammatory properties. Because of its high content of unsaturated fatty acids, it can lower blood pressure levels. Liquid extract. This remedial preparation is obtained from olive leaves, and is taken orally to support cardiovascular health, as well as for controlling blood sugar and cholesterol levels. Capsules. 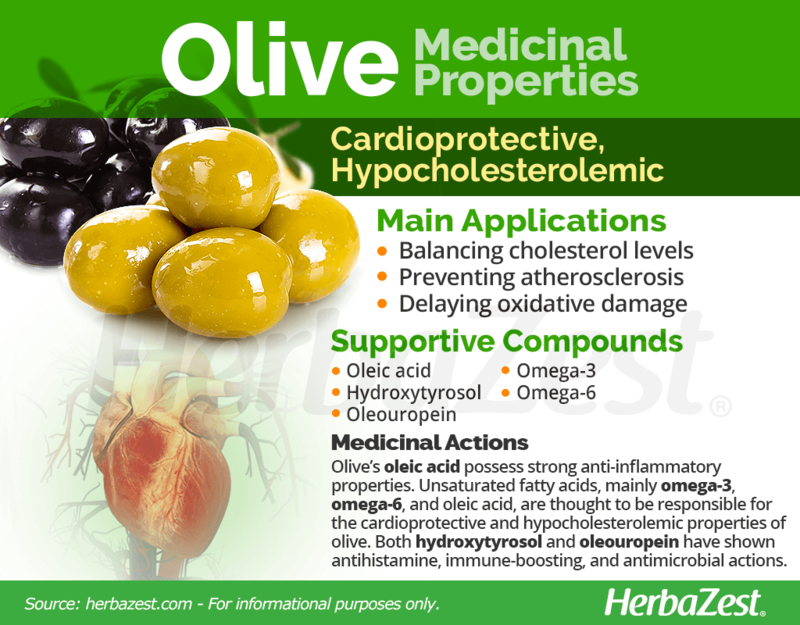 This supplemental form provides the exact daily dose to receive all the cardioprotective and antioxidant benefits of olive. Cured olive is easy to find in most grocery stores or local markets around the world. The most common presentations of olive include the whole, unpeeled fruit, which come in two different types: green and black, depending on the time the fruit was harvested. Olive oil is equally as popular a purchase as the fruits, and it can be found in most supermarkets and grocery stores in a wide range of qualities, from extra virgin (the purest version, which is extracted from the first cold press) to refined. Olive remedial forms, typically olive leaf extract and olive capsules, are mainly found in specialized health stores, and there is a wide variety of olive choices available through online retailers. However, potential buyers should consult to a physician before purchasing olive supplements, since they can interfere with certain medications, such as those for treating diabetes. Olive's natural habitat correspond to dry Mediterranean regions, as well as bushland vegetation in the tropics. Once the olive plant is well established, its life spam can be impressively long. There are claims of 1,600 year old olive trees still producing fruit. For commercial purposes, olives are propagated primarily by cuttings, truncheons or by budding seedling rootstocks. The trees propagated by rooting semi-hardwood cuttings come into bearing within three to four years after planting. However, they can also be grown from seed in a nursery, at a minimum temperature of 41°F (5°C) and lots of natural light before transplantation. Young olive plants need lots of sun light and adequate irrigation. Olive is considered a drought-resistant species because it thrives in areas where water stress is frequent. They tolerate saline or alkaline soils and those with a high lime content. However, the plant also responds well to sandy, well-drained soil. Well established olive plants are very resistant to cold weather. They can survive frost and temperatures of 19°F (-7˚C). Actually, olive requires substantial chilling for good fruiting, but it is injured when temperatures fall below 14°F (-10°C). Olives are wind pollinated, thus flowering during rain, high temperatures and dry wind conditions are potentially harmful to good fruit set. Although mature olive trees produce a large number of flowers, the fruit set is normally below 5%. Olives are harvested in autumn or winter, as the oil content and fruit characteristics change with ripening. The major pest problems are the following: olive fly (Dacus oleae, mainly in the Mediterranean basin), black scale (Saissetia oleae), olive leaf spot (Spilocaea oleaginea), olive knot (Pseudomonas savastanoi), and Verticillium dahliae. Widely distributed across the Mediterranean region, Africa and Asia, olive is an evergreen shrub or tree, which grows up to 49 feet (15 m) tall. It is slow to mature but can live for hundreds of years. Olive's leaves are evergreen, 1 - 4 inches (3 - 9 cm) long, elliptic, silvery in appearance, and borne in opposite pairs. Its white-greenish flowers are borne in axillary clusters, with a four-lobed calyx, and a four-lobed corolla, with two stamens (male parts) projected beyond the mouth of the flower. The olive fruit is small, 0.4 - 1.0 inch (1 - 2.5 cm) in diameter, and has a hard endocarp (the olive stone) surrounded by a fleshy, edible mesocarp. Olive fruits are harvested in the green to purple stage. Olive, scientifically called Olea europaea, is a member of the Oleaceae family, which contains 600 species spread out among 24 genera. The olive is one of the most economically important species in the family. It is an ancient family characterized by its opposite leaves, and can be found on all continents of the world excluding Antarctica. Over the course of history, different varieties and subspecies of olive have been identified. Nowadays, there are six natural subspecies of olive distributed throughout the world: O. europaea subsp. europaea (Mediterranean Basin), O. europaea subsp. europaea var. silvestris and O. europaea subsp. cuspidata (from South Africa and eastern África, to Arabia and southwest China), O. europaea subsp. guanchica (Canary islands), O. europaea subsp. maroccana (Morocco), O. europaea subsp. laperrinei (Argel, Sudan, Niger), O. europaea subsp. cerasiformis (Madeira). In addition, hundreds of olive cultivars have been developed to enhance certain traits, produce better olive-based products, or grow better in certain regions. For example, the Greek 'Kalamata' cultivar is dark and color and has a meaty taste, and the 'Mission' cultivar grows particularly well in California. Olives have rich history across many different cultures. Among one of the oldest cultivated trees, olive trees have been domestically grown since 4,000 BCE in Crete and olives were one of the most widely traded commodities in its region by that time. The olive is mentioned in Homer's Odyssey, and Ancient Greeks would use olive oil to moisture their bodies and hair, as well as to anoint kings and athletes. The Phoenicians brought the olive to Africa and Southern European shores. Olives were even found in ancient Egyptian tombs. Olive trees have, since, been cultivated in many parts of the world. 1,400 years ago, Muhammad, the Prophet of Islam, advised his followers to apply olive oil to their bodies. The cultural and religious significance of olives expanded across Europe alongside the spread of Christianity. The popularity of the olive for its medicinal and culinary purposes continued for centuries, and it found its way to the Americas in the hand of Spanish explorers in the 16th century. Olives are one of the most economically important and commercially cultivated herbs in the world. The olive is commercially produced predominantly for culinary purposes, and especially for its use in olive oil. Spain is currently the biggest producer, supplying over seven million tons of olives every year. Other large producers include Italy, Greece, Turkey, and Morocco. In 2011, the world produced nearly 20 million tons of olives, with the Mediterranean region producing 95% of that supply. There are 9.6 million hectares of land currently dedicated to the growing of olives. The demand for olives tripled between 1960 and 1998 and continues to grow. Athena, the Greek Goddess of Wisdom, is said to have brought the olive to the ancient Greeks as a gift. As a token of their appreciation, the ancient city Athens was named in her honor. Personal care. Olive oil is added to many skin products. Furniture. The wood of the olive tree is prized for its durability and is used in the making of furniture. Cleaning. Some people use olive oil as a hair conditioner, to remove stains from furniture, or as a substitute for shaving cream.